Knowledge is light. It lightens the soul, tames humans, influence the figuration of their character, that create civilization and immortal works. Just a few metres on the East of the already decomposed monastery of Panayias Podithou, there was until 1952 a two -storey spacious building. The ground room, people of Galata called it “The school of the Monastery”. It was one of the many secret schools, which the monks of the monastery considered a national and imperative duty, to cultivate the ecclesiastical knowledge. Through this they wanted to brace up the national morale of the young students, who definitely would be the tomorrow fighters and liberators of their enslaved country. It is hard to say when the operation of the school in the monastery Podithou started. But definitely during the middle of the 17 th century it operated (Matheos Galatianos, 1673 and Archbishop Philotheos end of 17 th century). At the school of the monastery students from Galata but also form the next village Sina Oros studied there. 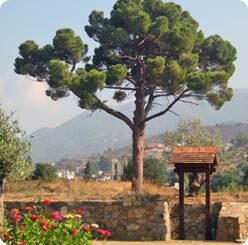 With the death of the last monk teacher Chrysanthos in 1888, the operation of the school of the Monastery of Panayias Podithou is interrupted, after giving so much to the area, in Cyprus and the whole Greek genus in general. In 1890 a temporary school in a house in Galata operates since 1894. 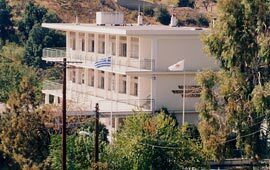 Then Charalambos Piperkos builds the first school of the community next to the church of Saint Sozomenos. In 1919 the second school of Galata operates, at first as a girls' school. It was built with the expense of the holymonk Philotheos and on his honour it was named “Philotheon”. It's a work of Mastre Philippos Loizou. In 1938 “Philotheon” expands with two more teaching rooms, with a donation of Lambros Philippou, who lived in Africa. In 1976 the contemporary school building was built. It is a two-storey building with several amenities and satisfying equipment. It is a work of the construction company “Philippos Loizou Ltd” and has the name of the donator of “Panaretio Primary School of Galata”. 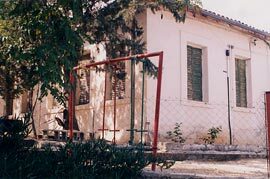 The Panaretio Primary School of Galata operates today with 57 pupils and Pre-primary with 33 children.